Respectful of nature and the skin, the Ben & Anna Provence Natural Deodorant Stick Papertube naturally regulates the process of perspiration and protects your skin. Rich in baking soda, it neutralizes the bad odors due to bacteria. Composed of essential oil of sage, it limits the production of sweat. Ideal in case of excessive sweating. With its fresh and summery fragrance, it invites us to Provence, in the heart of the lavender fields. Its recyclable paper packaging makes it zero waste! 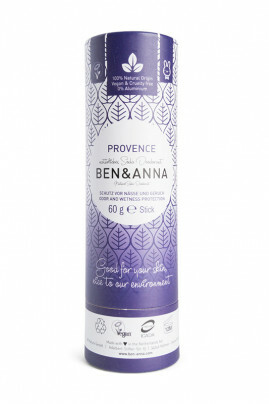 Adopt Ben & Anna Provence Natural Deodorant for fresh underarms all day long! A vegan deodorant for naturally fresh armpits! Without aluminum and parabens, it is used on previously dry and cleaned skin. Practical, just push at the base of the cardboard tube so that the natural deodorant Ben & Anna pops out. A deodorant with natural composition and ecological packaging!